Ingredients: for one 8 to 9 inch single crust pie shell. In a large bowl, mix flour and salt together, then add shortening. Cut into mixture using a pastry blender or two knives or a fork. After cutting, mixture should be dry and resemble cornmeal. Over cutting would result in a soggy mixture. Add water in a slow trickle or a tablespoon at a time. Mix just until dough holds together; no need to use all the water. Form dough into a ball. Wrap in a piece of waxed paper sprinkled with flour and chill for around 30 minutes. Dust tabletop and rolling pin with flour. Press dough lightly with the rolling pin. Form the shape of the pie plate as you roll the dough. The solid particles dotting the dough are the pieces of shortening. These particles make the dough flaky once baked. While shaping with the rolling pin, turn over dough every now and then. Do not roll the pin until the edges of the dough to prevent tearing. The bottom of the dough should move while it is rolled. It is time to turn the dough when you feel that its bottom has stuck to the tabletop. When you invert the dough, dust tabletop and rolling pin with flour again. To invert dough, use the rolling pin as hanger. Wrap the dough around the pin then lay out the dough on the table again, making sure what was once its bottom is now the top side. 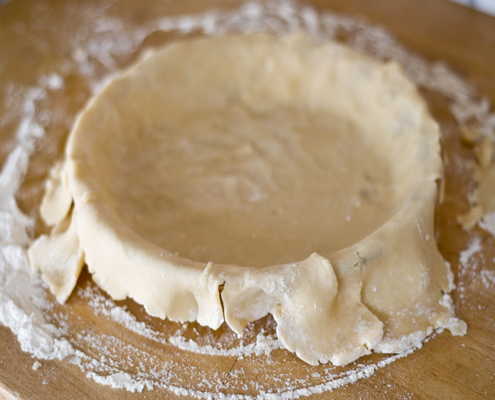 Continue rolling until dough is one or two inches bigger thean the diameter of the pie plate and baout 1/8 inch thick. Put pie plate over the dough to check the size. Line the plate with dough. Allow the extra inch to hang from the plate edge. Fold in excess dough araound the edge of the plate. Design the pie edge as desired. 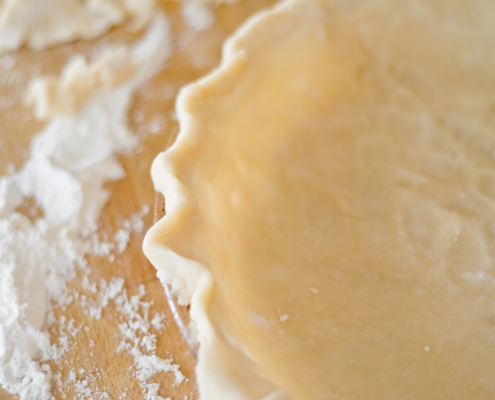 To make a fluted edge, pull out dough on pie edge with the left pointed finger as you pull in dough on both sides with your right pointer and middle fingers. Repeat procedure on entire edge of pie. Or press tines of a fork on the edge of the crust. Note: if you are baking the pie shell and the filling seperately, you have to take precautions to keep the shell from puffing out. To do this, prick the shell all over with a fork to release the air. Or, lay out a shell of aluminum foil over the base of the shell and top this with dry beans. Bake (if whithout filling) at 450 degree for 10 12 minutes. To make a two crust pie(as for apple pie or buko pie), double the amount of each ingredient. Divide in half after you have formed it into a ball. Roll each dough ball separately. End.